“Clubhouse” is a 3,450 sq. 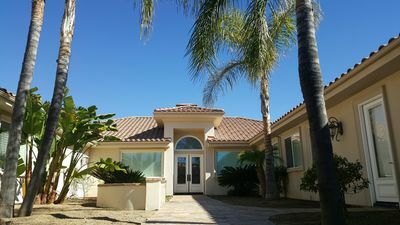 ft. luxury executive home in a wonderful gated community that sleeps 8-14 people. 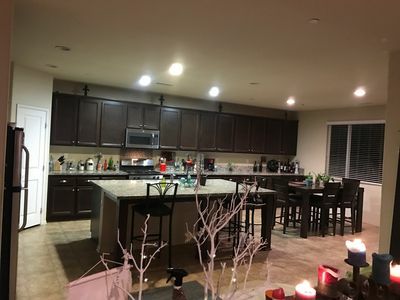 4 bedrooms, 3 1/2 bath upscale vacation rental in the La Quinta area of Palm Springs.Outdoors: The yard is unbelievable with a custom saltwater pool & spa, waterfall and tanning shelf, 7 hole putting green, TV’s, 2 fireplaces & firepit and plenty of outdoor seating. Cook dinner in the 8 seat palapa with amazing outdoor kitchen featuring gas BBQ, grill, refrigerator, drink cooler, sink, trash, heaters, fan and Sony Internet TV.Indoors: This spacious one level home features a fully-equipped gourmet kitchen with slab granite counters, stainless steel appliances, double ovens, microwave, refrigerator with ice & water dispensers, eating bar with seating for 4 and nook table with seating for 4.The Living room features a big screen High-Definition TV with Bluray, wetbar, gas fireplace and comfy seating. The Dining Room seats 8 with french doors out to the yard. 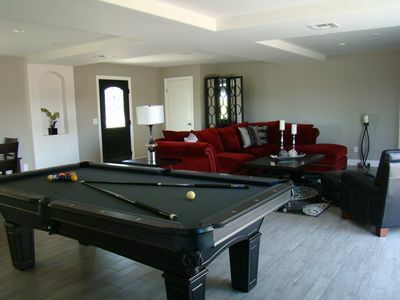 The Game Room has a full-size pool table with chalk, cues and seating.Bedrooms: The Master Bedroom Suite has a King bed, french doors to the pool, TV with Bluray, soaking tub, large walk-in tiled shower and spacious master closet that can accommodate an airbed if needed. Bedroom #2 is the detached casita with Queen bed, kitchenette (with sink, microwave, coffeemaker, dishes & flatware and mini fridge), dual-sided fireplace, flatscreen TVs in living area & bedroom, Sony Playstation 3, Bluray, loveseat, chair-and-a-half hideabed and attached private bathroom. 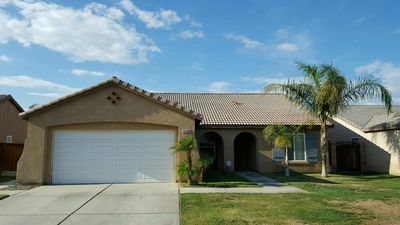 Bedroom #3 has a Queen bed with flatscreen TV, Bluray, private door to the front courtyard and attached Jack ‘n Jill bathroom. Bedroom #4 has 2 extra long Twin beds, flatscreen TV, Bluray and attached Jack ‘n Jill bathroom. Some rooms have the ability to access your personal Netflix account.Bed & Sleeping Summary: 1 King, 2 Queens, 2 XL Twins, 2 Queen Airbeds, 2 Twin Airbeds, 1 Chair-&-a-half-Hideabed, 1 Portacrib. 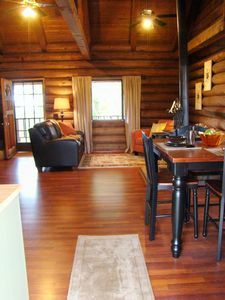 Sleeps 8 in beds, and 14 utilizing all airbeds and hide abed.Other Amenities: Wireless internet. High quality linens, bath and pool towels plus a starter set of L'Occitane soaps in each bathroom. Fully equipped laundry room with washer, dryer, ironing board and iron. Off street parking for 6. 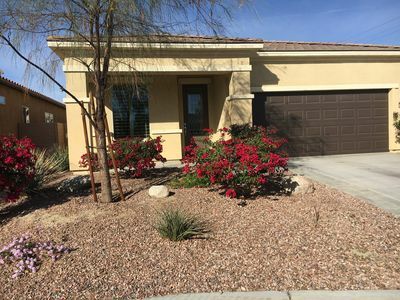 Location: This gorgeous home is in one of the very best locations, just off the “Golden Mile” Avenue 49; minutes from top golf resorts, restaurants and shopping in La Quinta, just around the corner from the Empire Polo Club, and near La Quinta Resort, and Indian Wells Tennis Gardens. Perfect for your golf group, family or corporate retreat. 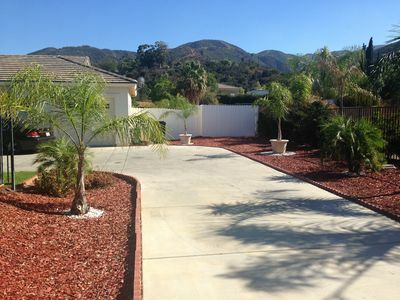 The Southern California Very Exclusive semi secluded GET-AWAY over 4,000 sqft. Incredible Private Estate! 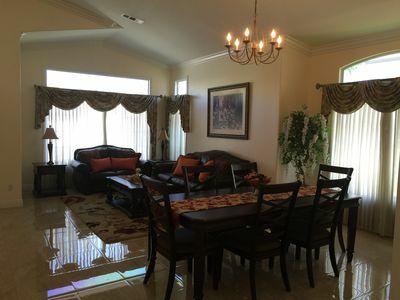 Pool, Tennis Court, Game Room, and more! Perfect Location! 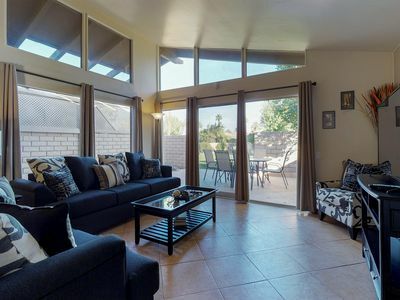 Desert condo with shared pool - walk to Coachella festival grounds!